“The thrill of Vegas, only better!” jokes the billboard for a local casino. Except it wasn’t meant to be funny. The humor is unintentional, but it’s hard to keep a straight face when a small-town casino claims to eclipse The Strip. It’s a bluff that would make even Maverick blush. In all fairness, the local place is very nice—arguably, the ace among gaming establishments in our area—but compared to the palaces of Vegas, it’s a house of cards. If the casino wants to advertise effectively, it should play its real hand instead of playing tricks. 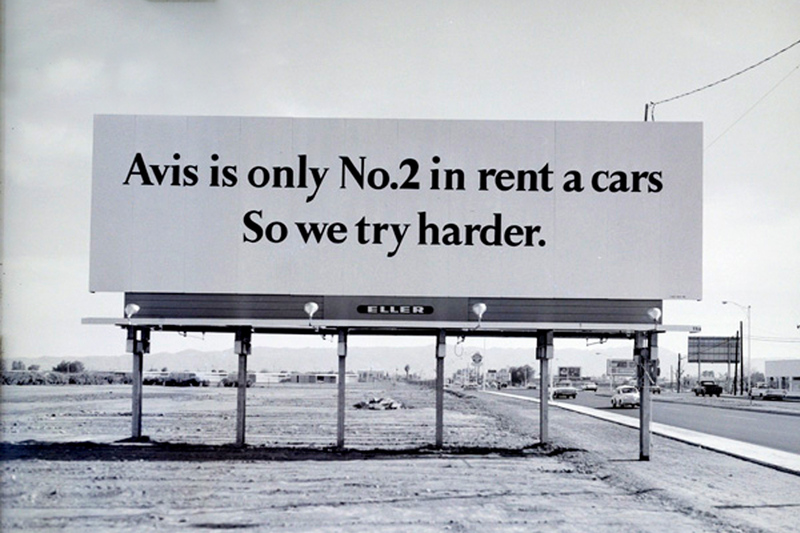 They could learn a lesson from Avis’ classic We Try Harder campaign of the 1960s. At the time, Hertz car rentals was in first place; Avis was a distant second. Rather than try to project a false image of strength, Avis acknowledged its weakness, embracing its underdog status and turning it into a selling point. The campaign was an instant hit and ran for many years, highlighting all the ways Avis had to try harder since they’re weren’t the first choice in car rentals. Customers appreciated the honesty and humor of the ads and the actual hard work of Avis employees. As a result, the company turned its losses into profits and is still around today. For a minute, you might forget you’re not in Vegas. But the exact wording doesn’t matter as much as communicating something that’s true—a message that shoots straight and eschews double-dealing. That’s a winning hand for any ad campaign and company.